An abandoned house in the exclusion zone around the Chernobyl nuclear reactor. When Chernobyl melted down on Apr. 26, 1986, the ruined plant released 100 times more radiation into the air than the fallout from the nuclear bombs at Hiroshima and Nagasaki. 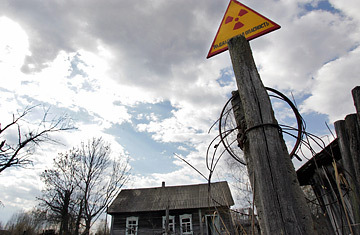 Today the 19-mi (30-km) exclusion zone around the plant remains uninhabitable, and between 1992 and 2002 more than 4,000 cases of thyroid cancer cases were diagnosed among Russian, Ukrainian and Belarusian children living in the fallout zone. "It's the largest industrial accident in the world," says Fuller. "It'll be contaminated for tens of thousands of years." Fortunately, work is being done to prevent further radiation spill from the ruined sarcophagus of the nuclear plant.